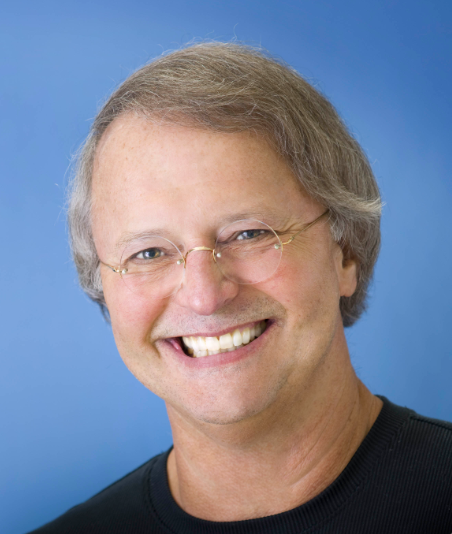 Mike Muhney’s career has truly been uniquely, irrefutably, and intensely focused on relationships. 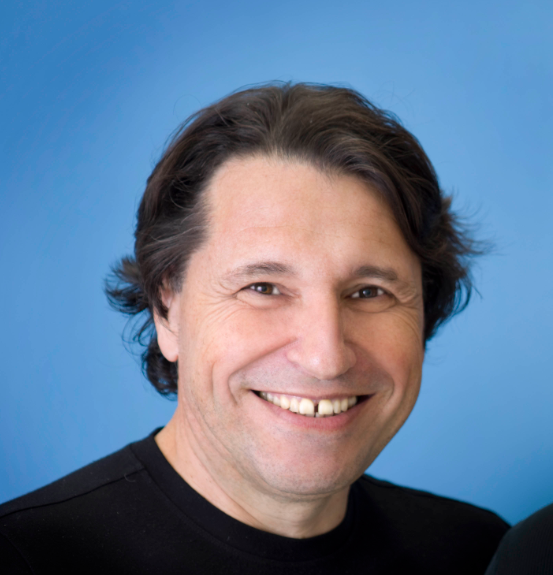 As a software entrepreneur he has developed world-class tools to enable people to realize and achieve more effective, meaningful, real, efficient, and productive relationships in both business as well as personal aspects of people's lives. In other words, helping people with their entire networks and everyone in them. Born and raised in Chicago, Mike graduated from the University of Illinois Urbana-Champaign in business. He started his career with IBM in the pre-PC Mainframe era and was classically trained as a Marketing Rep (a fancy way of saying “Sales”) in their 6-month deep-dive intensive Sales Training School of which he graduated 6 out of 66 in his national class. He went on to have a very successful career with IBM before he left to go on to even greater achievements. Mike is best known as the Co-Founder and Co-Inventor of ACT!, the product that literally created the entire Relationship Management software category and global industry and has been purchased by over 10 million people in the world and which is still today, after 28 years, the standard and leader in the Windows world, and which is acknowledged as the catalyst for today's CRM multi-billion industry. 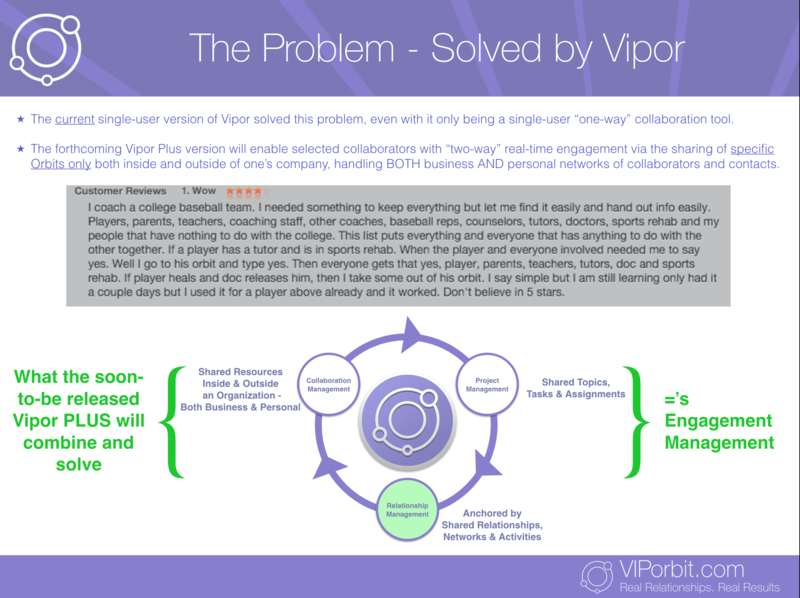 Today Mike has gone on to invent his second award-winning product Vipor that is presently designed to address today’s mobile culture beginning with a focus on the Apple global user base approaching 1.1 billion devices and 700 million users. 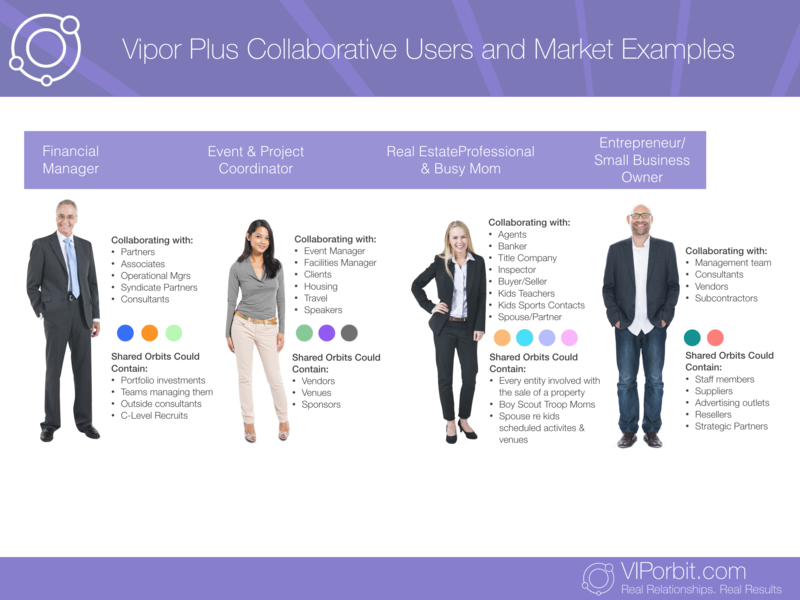 Vipor addresses the users needs to blend, and manage, their entire networks for both their business as well as their personal relationships, providing a seamlessly integrated multi-functional solution built into one App. 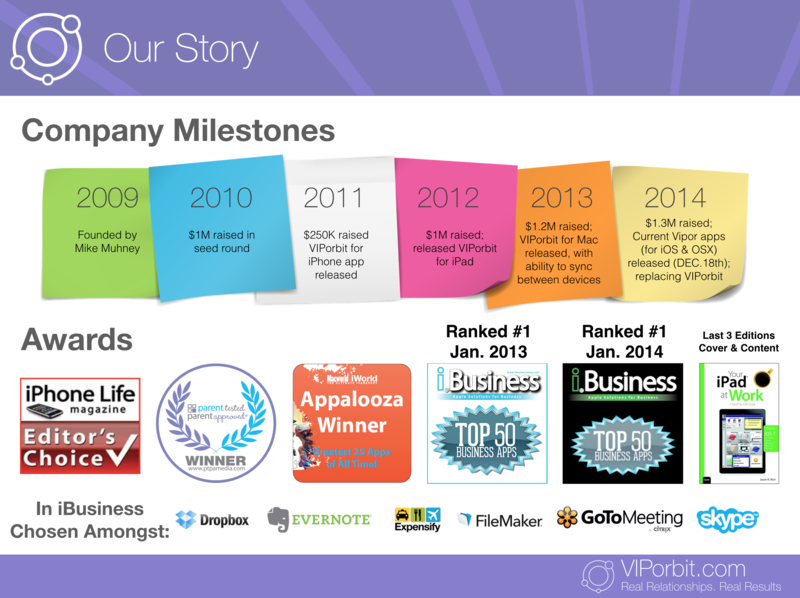 VIPorbit Software has been awarded the iPhone Life Magazine’s Editor’s Choice Award, graces the cover of the last three editions of QUE Publishing’s Your iPad at Work book, and for the last two years has been ranked #1 of iBusiness Magazine’s “Top 50 Best Apps” against such notables as Evernote, Dropbox, Filemaker and others. 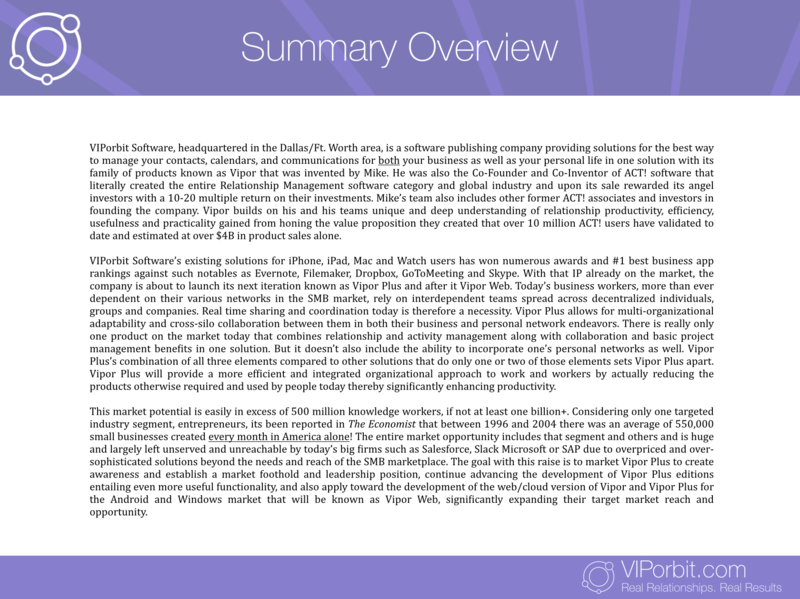 More info on Vipor is available at www.VIPorbit.com. Max. J. Pucher started his career with IBM where he worked 15 years internationally – including 3 years in Saudi Arabia – in hardware engineering, consulting and finally sales. He later wa the Founder and Chief Technology Officer of ISIS Papyrus Software, begun in 1988 and now 27 years in business. Today it is a medium size, but global software business with Fortune 1000 clients. Today it has 300+ employees worldwide. Long before PDF, he was among the first to propose the ‘electronic original’ for formatted outbound documents when others still created line-mode printstreams. He invented the PrintPool, which is a spooling database for ‘electronic originals’ used to sort/bundle/consolidate documents from various applications for printing, enveloping and archiving. He designed the core technology for the Papyrus Platform with its business architecture repository, distributed OO transaction engine and its embedded object relational DB. He has software patents in the area of Artificial Intelligence for the so-called User-Trained Agent, a machine learning component for process management. It monitors the process for user activity and discovers in real-time the complex patterns that represent ‘actionable knowledge’, which it will recommend. Because of my belief in social networking concepts I joined forces in 2010 with the Co-Founder/Co-Inventor of ACT! 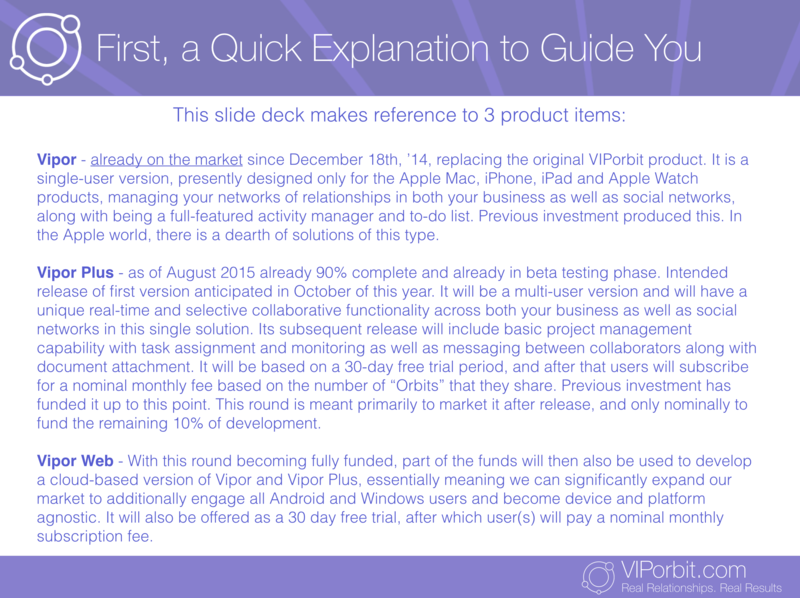 – the first Contact Management product for the PC – Mike Muhney. 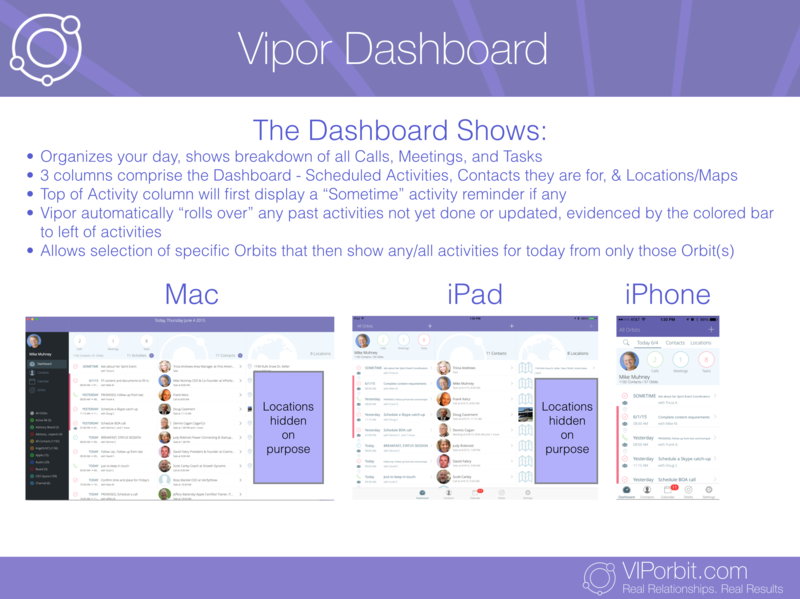 Together we founded VIPorbit Software International, Inc. to offer Mobile and Cloud solutions with Vipor®, beginning with the only full-featured Mobile Contact Manager designed for the iPhone, iPad and Mac. International product manager covering design, marketing, support and distribution of ACT! Product manager for web-based application for SalesLogix CRM. An original investor in ACT! 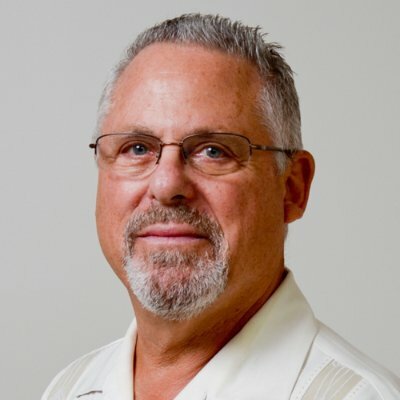 software and Board Member during its life before being sold to Symantec, Dr. Jacobson brings a wealth of knowledge, insight, experience across a wide landscape beyond healthcare, and entrepreneurialism to VIPorbit Software International, Inc. Presently, Dr. Jacobson is the Chairman of MedCare Venture Group, with $1b under management spread over 3 funds. As vice chancellor for health affairs, Jacobson served as Chief Executive Officer and academic head of the Vanderbilt University Medical Center, which had annual net revenues of $2.3 billion, more than 16,000 employees and 2,100 full-time faculty members upon his departure. The medical center encompasses more than 20 entities, including the Vanderbilt School of Medicine; the Vanderbilt School of Nursing; Vanderbilt University Hospital; the Vanderbilt Clinic; and the Vanderbilt Medical Group, one of the largest physician practices in the Southeast. Last year Jacobson was chosen by Modern Healthcare magazine as among the 50 most powerful physician executives in the United States. In 2002 he was elected into the prestigious Institute of Medicine of the National Academies. He is also a leader in the field of technology transfer, having chaired the board of the Vanderbilt University Technology Corporation. He has been a Board of Director of 16 companies, including Ingram Industries, Inc. and Merck Pharmaceuticals. 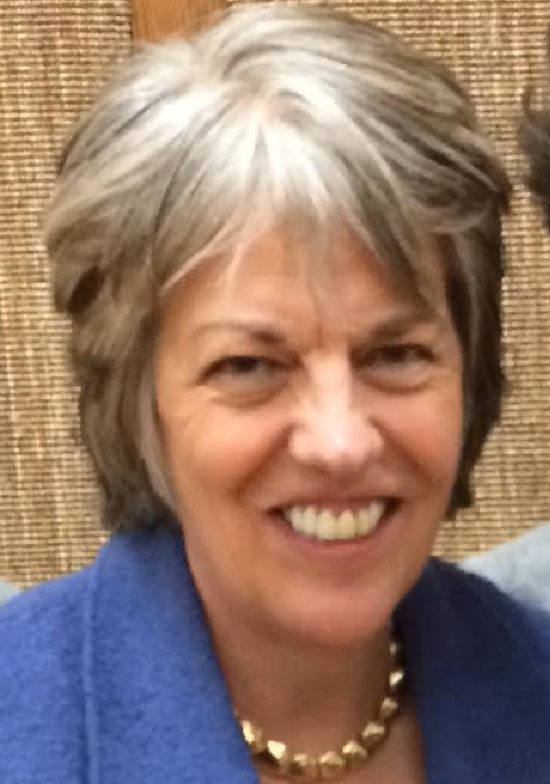 She has had the honor of helping people and businesses achieve breakthrough results through powerful connections. Her book "How to be a Power Connector: the 5-50-150 Rule for Turning Your Business Network into Profits" was published by McGraw-Hill in May 2014 - named the #1 Business Book of 2014 by Inc. magazine. She has applied her networking techniques within diverse environments: as CEO of both public and private companies, within management positions with Fortune 500 companies, as an entrepreneur, and as a startup funding advisor and angel investor. Her greatest thrill is connecting with people and connecting them to each other. Dennis Cagan is a noted high-technology industry director, executive, and entrepreneur. He has founded or co-founded over a dozen different companies, and has been a CEO of both public and private companies, a consultant, venture capitalist, private investor, and professional board member – 53 fiduciary corporate boards. In 1979 Dennis was the Keynote Speaker at the first COMDEX Show in Las Vegas. In 2011 he was elected to the IT Hall of Fame - Channel Wing, administered by CompTIA. In 2013 the Dallas Business Journal and NACD selected him as one of 12 Outstanding Directors in North Texas. Dennis is a recognized authority on corporate governance, boards of directors, information technology, including: mobile applications, Internet, software, hardware, systems, and communications, in the disciplines of governance, strategy, distribution channels, marketing, services, and logistics. Dennis is primarily engaged in management consulting through his firm Caganco Incorporated, founded in 1983. Caganco specializes in two areas: working with private company ownership and leadership to develop and manage world-class governance through boards (both fiduciary and advisory), and providing his trademarked Shadow CEO™ services comprised of an intense side-by-side approach to helping C-level executives go beyond their current experience set. He is a regular contributor of feature articles published in Directors & Boards Magazine, and speaks widely on the subject of boards of directors. During his career Dennis has been responsible for international sales and operations, having actively done business in 35 countries. He has authored dozens of articles and spoken internationally. In 1976 he founded the David Jamison Carlyle Corp. (his 5th start-up), turning it into one of the country’s largest distributors of computer peripherals. After being included in Inc. Magazine’s first Inc. 100, he took DJC public (NASDAQ) in 1981. Since 1985, in addition to his consulting, Dennis has served as an interim C-level executive dozens of times – often for companies where he was already a member of the board of directors. Dennis currently serves on five corporate boards of directors. He attended the University of California at Los Angeles (UCLA) where he majored in economics, and he has an honorable discharge from the USMC. Dennis and his wife Angelia live in the Dallas area with their youngest of four daughters, and are active in their church. 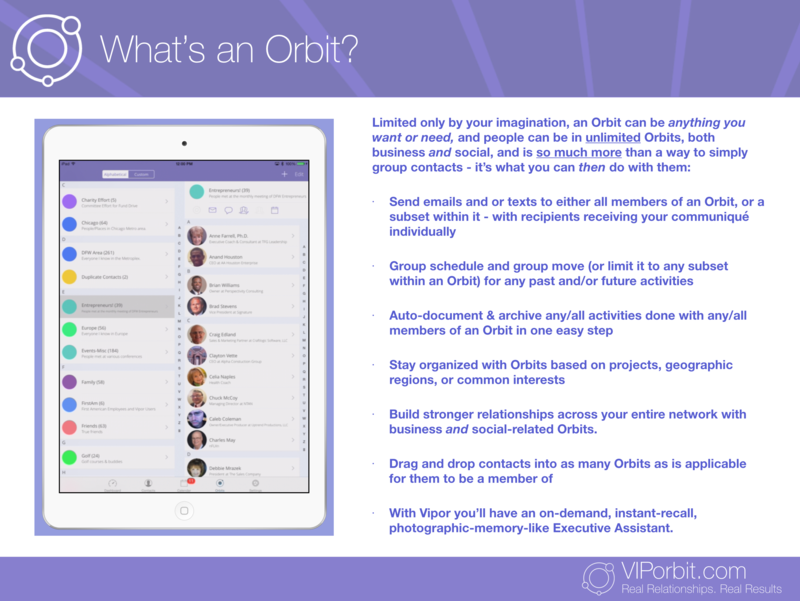 No, Vipor is presently native to each of the iPhone, iPad and Mac. 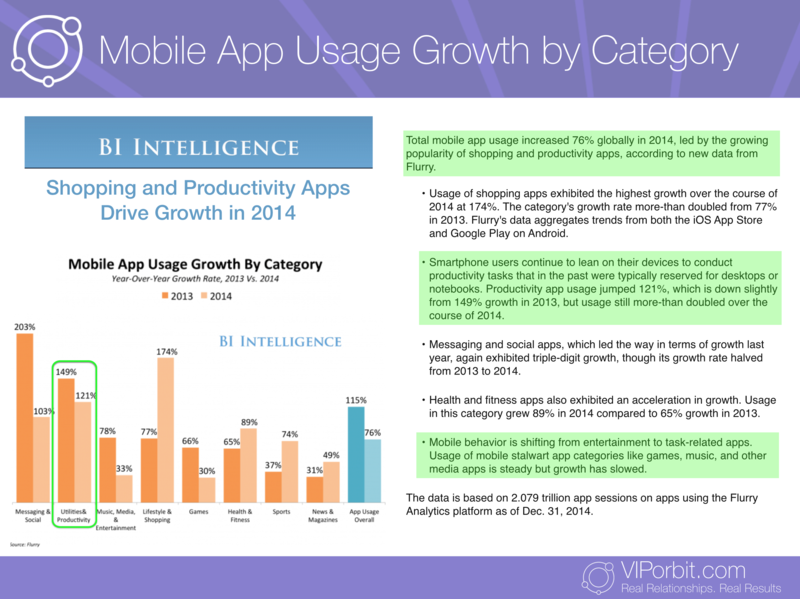 Both the program itself, plus the data, reside on your device(s). 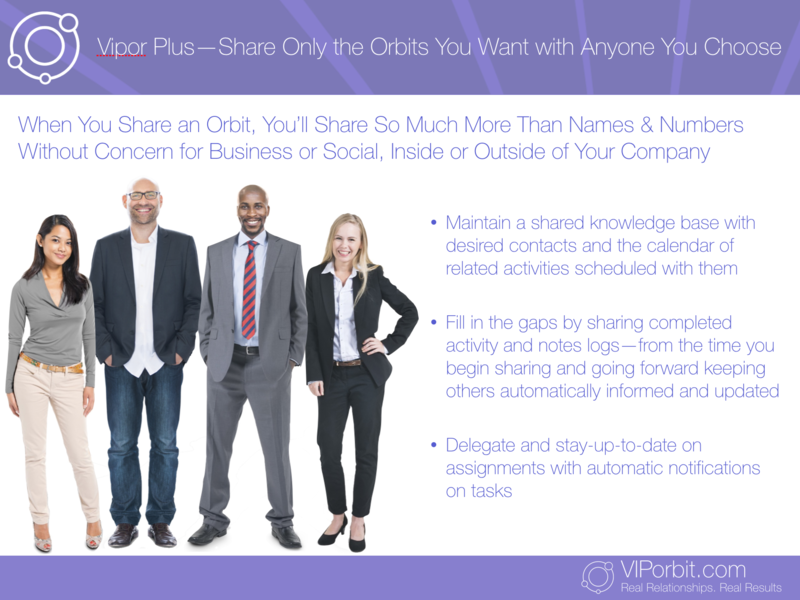 The Vipor technology, though, does use the cloud for 2 things very important to you (and each of us too!) - (1) the cloud is the conduit used to real-time sync your data between Apple devices should you have the Vipor versions on multiple devices, and (2) an automatic backup of your Vipor database is kept at all times, in real-time, so that if you lose (or have stolen) any of your devices you are completely protected and can never "lose" your data. What about Android and/or Windows versions? Are there any plans for those? That's a great question because it points out the inherent value of Vipor. 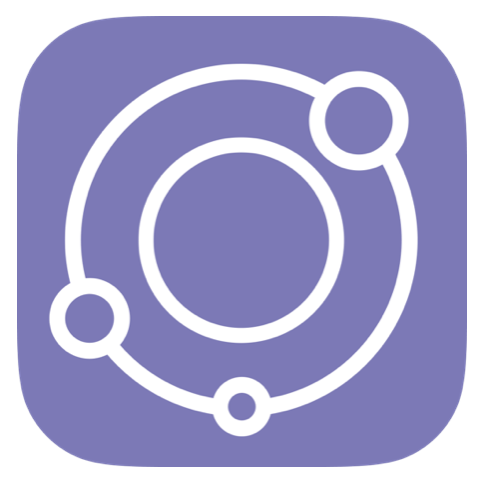 Regarding Android and because it is open-sourced, there is no "single" Android platform, nor can they be realistically managed by us as a result. There are hundreds of versions of Android. 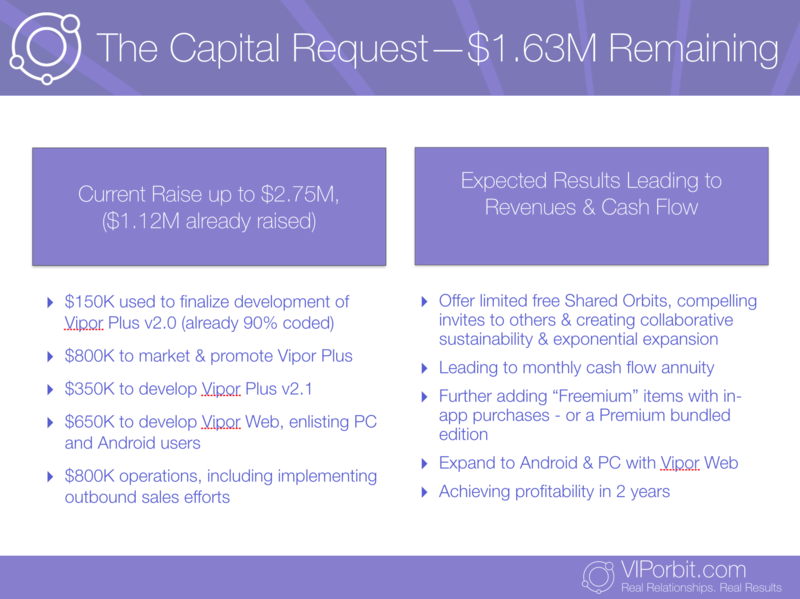 The way that we will engage Android users will be via Vipor Web - a portion of this round if fully raised which will be devoted to it - will enable any/all Android users via their device browser to access the Web and thus be able to enjoy the same value as native Apple users do with Vipor. 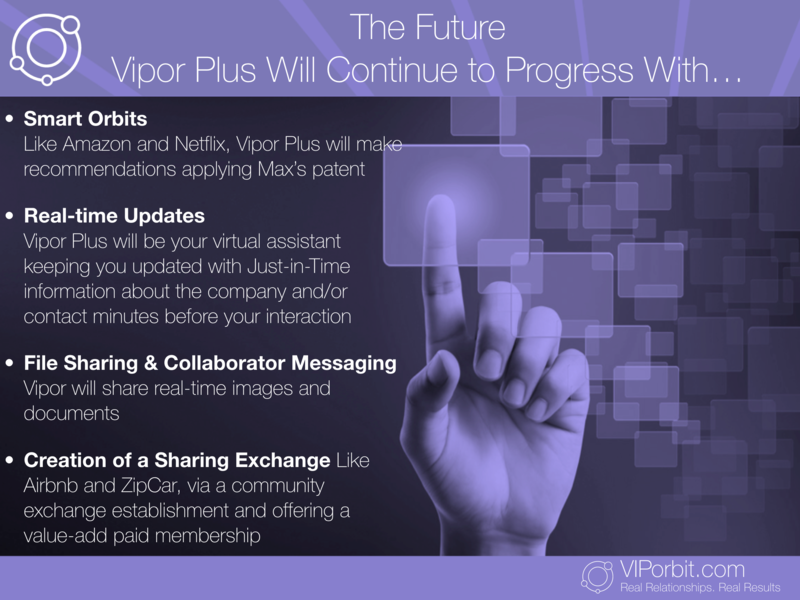 Regarding Windows, their devices - PC, smartphones, and the Microsoft Surface tablet, all with browsers - will also be able to access Vipor via the Web. As a result, a user could then have a Windows PC, an Apple iPad, and an Android smartphone and Vipor will be accessible via all of them along with real-time syncing between them. You can then imagine the enormous addition to the 1.1 billion Apple devices out there used by over 700 million people that enabling Android and Windows users with could mean to our market expansion and opportunities. As the Co-Inventor and Co-Founder of ACT! that created the entire Relationship Management global industry!, is this just another "ACT!" for Apple users? No. It's more, and it's different altogether yet without abandoning the cornerstone of a relationship focus (vs. a "to-do" list focus as some are). 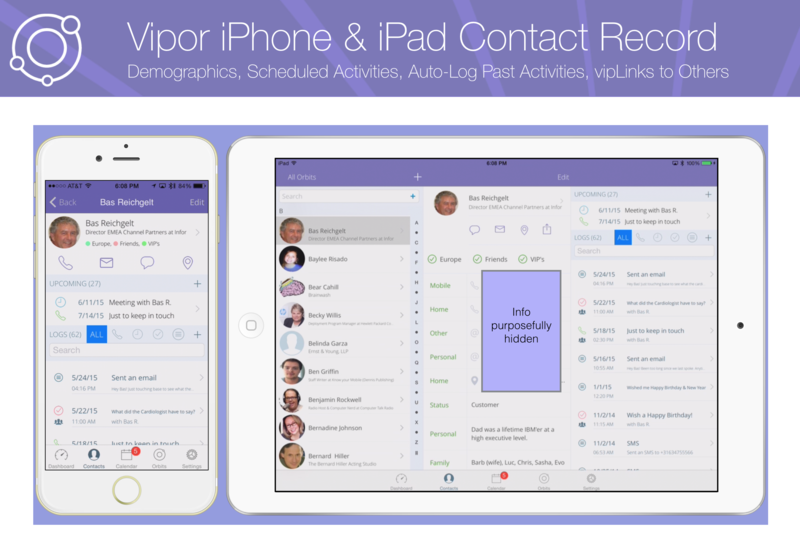 Vipor does things in a much more agile way than ACT! ever did. Why? In part because of new technology today that didn't exist back then (or that subsequent owners of ACT! never took advantage of), new ways of working today, the blurring of lines between one's business and social networks of relationships along with the fact that the same person can be in many networks, and finally simply new ways of envisioning design today. 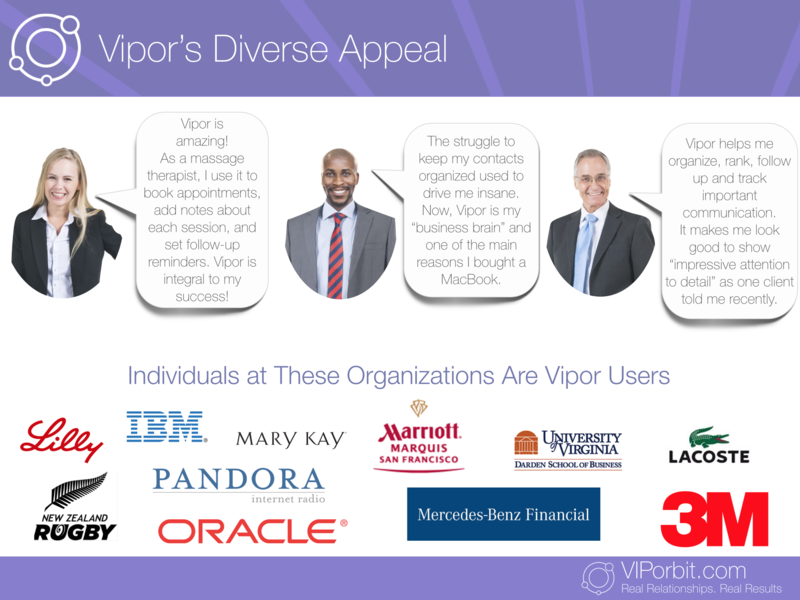 Is Vipor just for salespeople? Absolutely not! 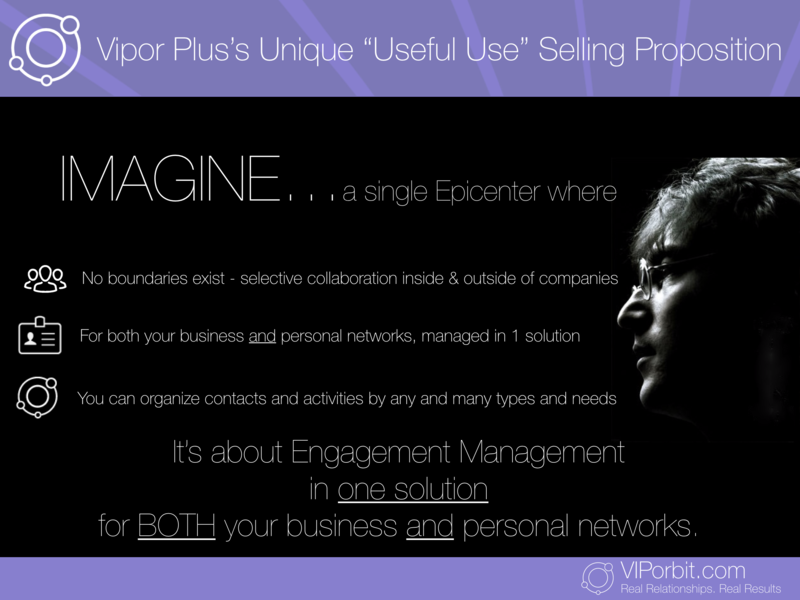 Because Vipor is customizable (it has unlimited User-Defined-Fields capability) no matter what you do and regardless of what industry you are in, it is adaptable to any person who wants a better way to organize and manage their relationships across their variety of networks, both business as well as social. 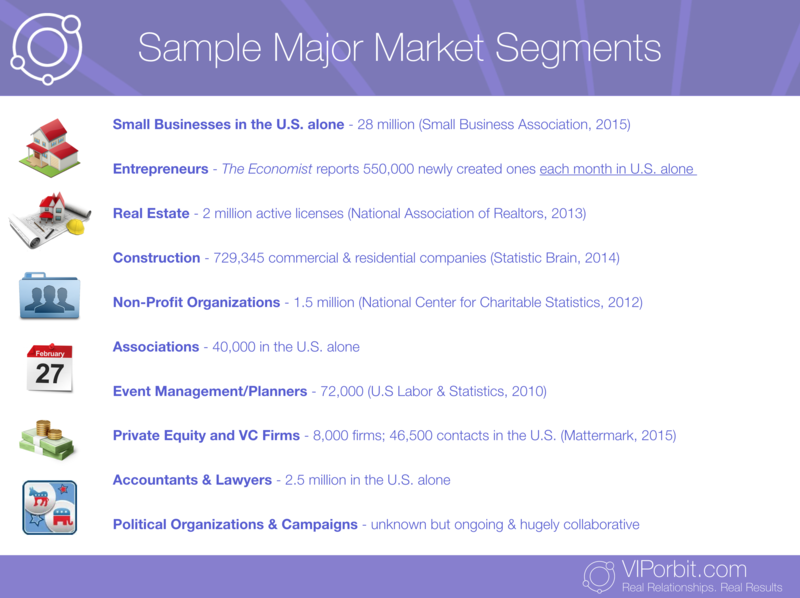 Salespeople have quotas and have to track progress regarding forecasting. 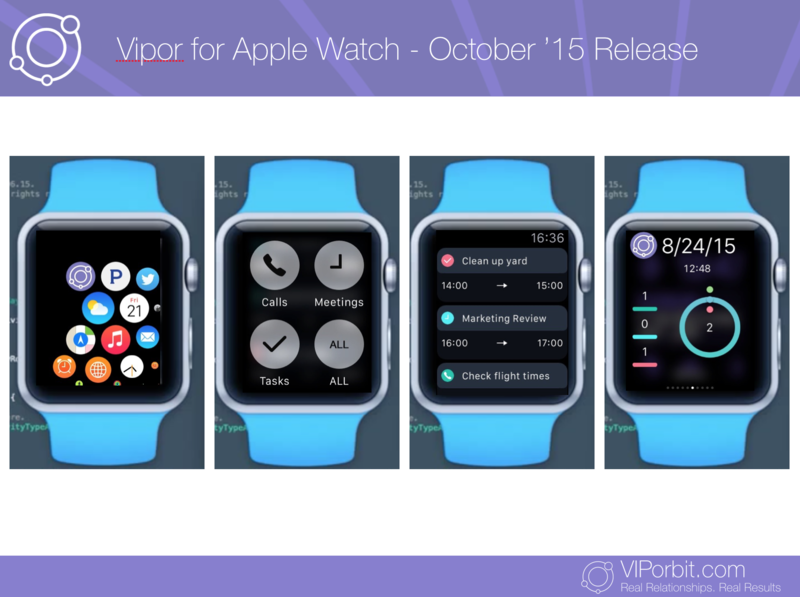 They could therefore customize Vipor to meet and track those needs. However, the majority of people are NOT in sales and therefore have no need to do that. Universally, however, both salespeople and non-salespeople live and die by the extent of both their quantity as well as quality of their networks, which virtually anyone and everyone in business as well as social depends. 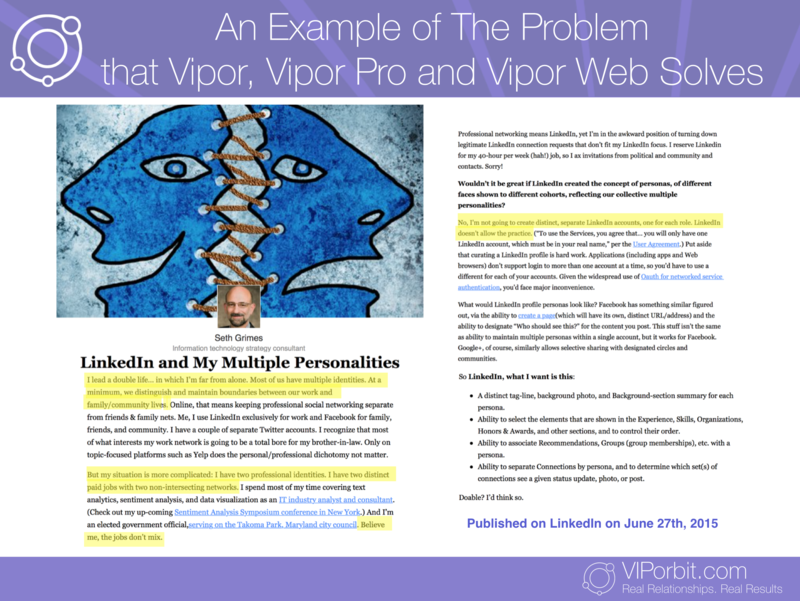 Therefore, for example an Architect or Lawyer could adapt Vipor to what they want for themselves and/or their business, without the burden of having to use a product like Salesforce which is not only enormously expensive compared to Vipor Pro but is overkill for things that just don't and won't ever apply to them. 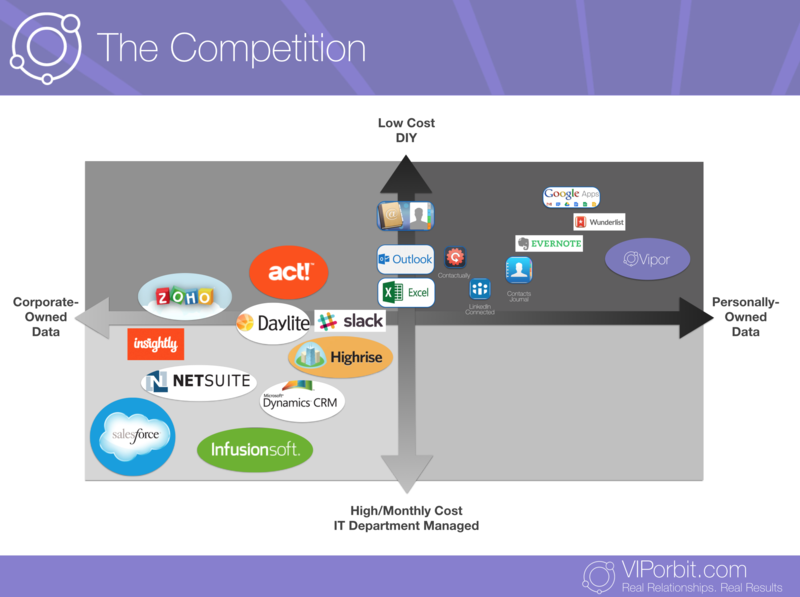 Does, or will, Vipor ever become a front-end to Salesforce.com? It is on our roadmap. 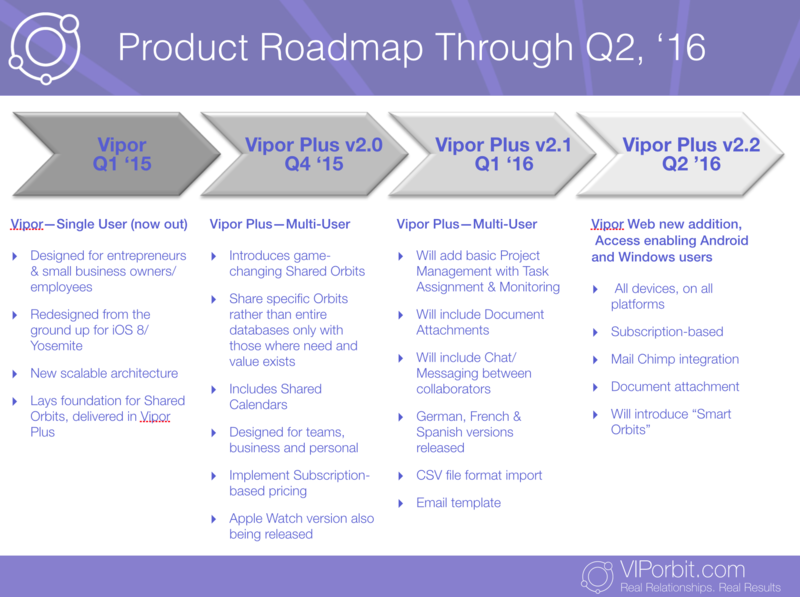 Will there be an API (Application Program Interface) for Vipor such that it can be linked to other products like Quicken for example? 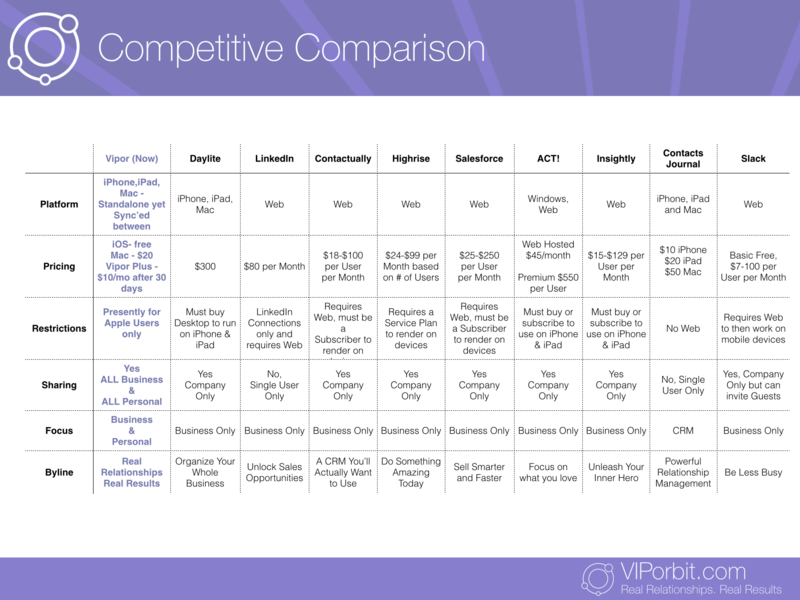 What is the difference between Vipor and a CRM system? There's many. Although both are concentrated on your contacts from a relationship perspective, CRM is only narrowly useful considering the full extent of each of our various business and social networks of relationships. CRM is typically company-controlled, is available only to users inside-the-company-only (and usually further restricted to sales/marketing/customer support people), and is further restricted for the most part to just prospects and customers. So, the question is then raised "what about everyone else - where do I put them if relationships are so essential?" That's where Vipor is distinguished from them. 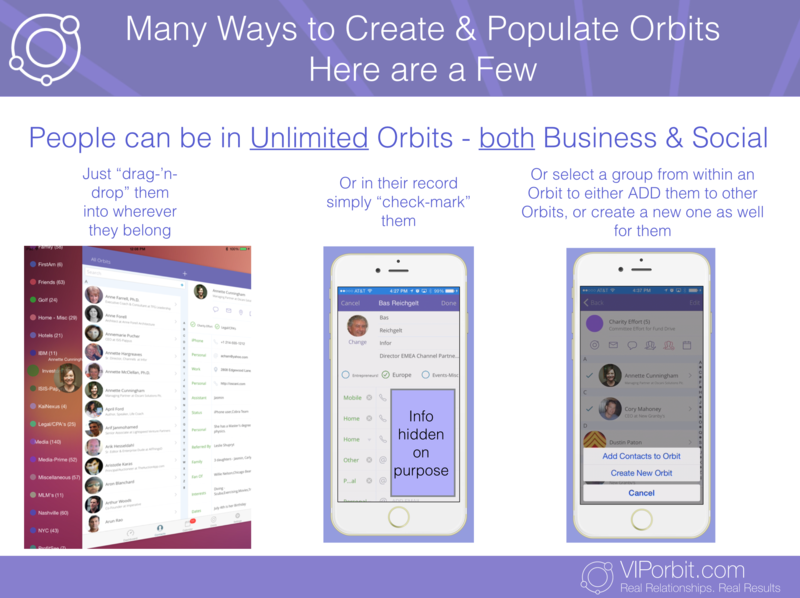 Vipor allows you to manage your ENTIRE network of BOTH your business AND social networks of relationships, further allowing your relationships to be in as many "Orbits" defining your categorization of your relationships, meaning that they can be in BOTH business and social networks. CRM is also typically focused on forecasting, quota management, and pipeline metrics. However, most of the world of businesspeople don't do nor need that. What we all do have however are our own various networks both business and social that provide resources and opportunities to us as none of us would succeed in any fashion without them. 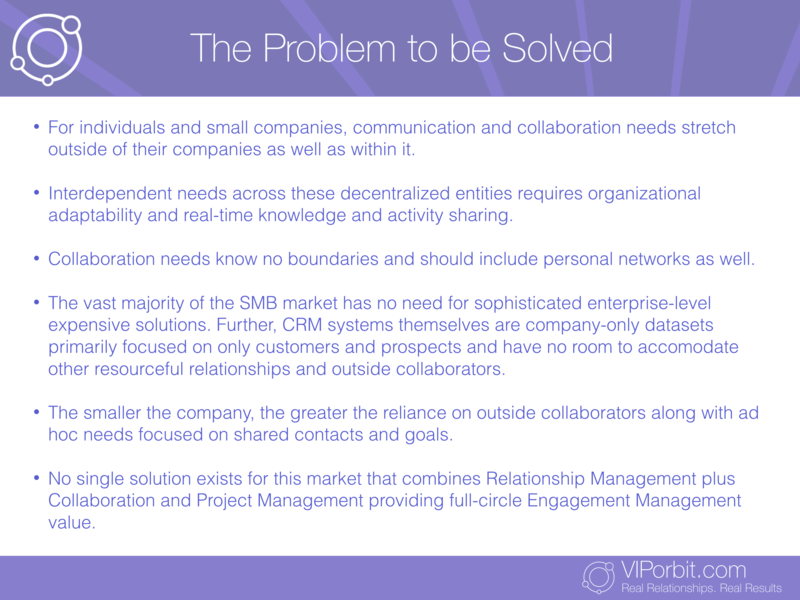 So Vipor, without any boundaries that restrict use to inside-company-only-for-just-customers-and-prospects relationship management, like CRM does, gives all users in all businesses a complete tool to manage all relationships without boundaries. And, it is much more affordable in comparison as well. 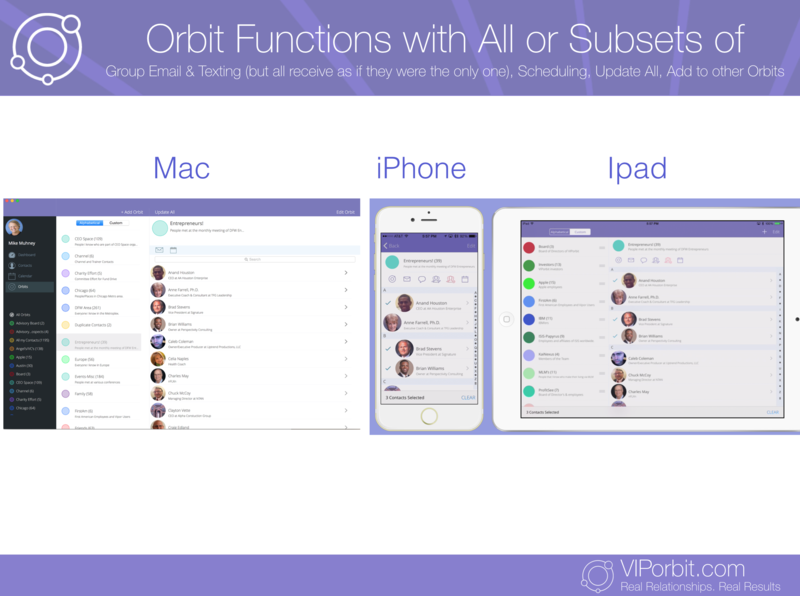 Enter your name and email, and we’ll let VIPorbit Software know you’d like an introduction. 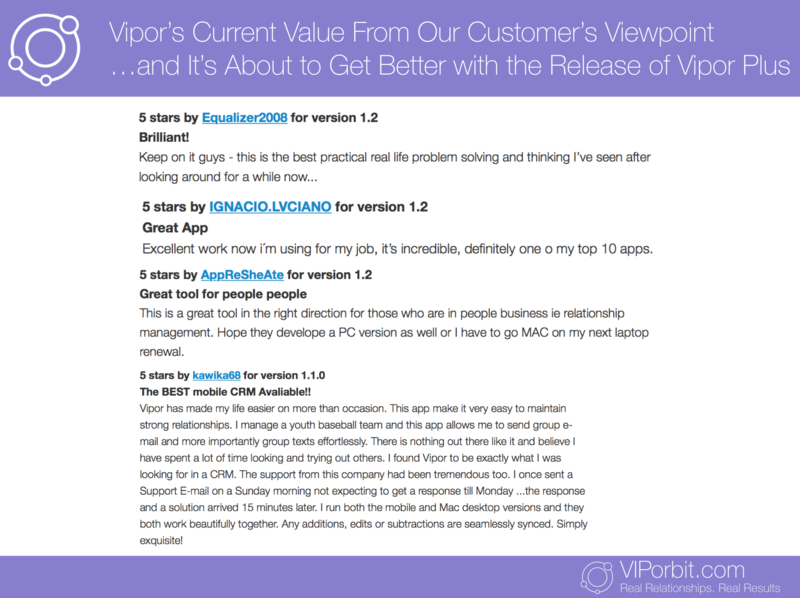 You will now receive updates for VIPorbit Software.